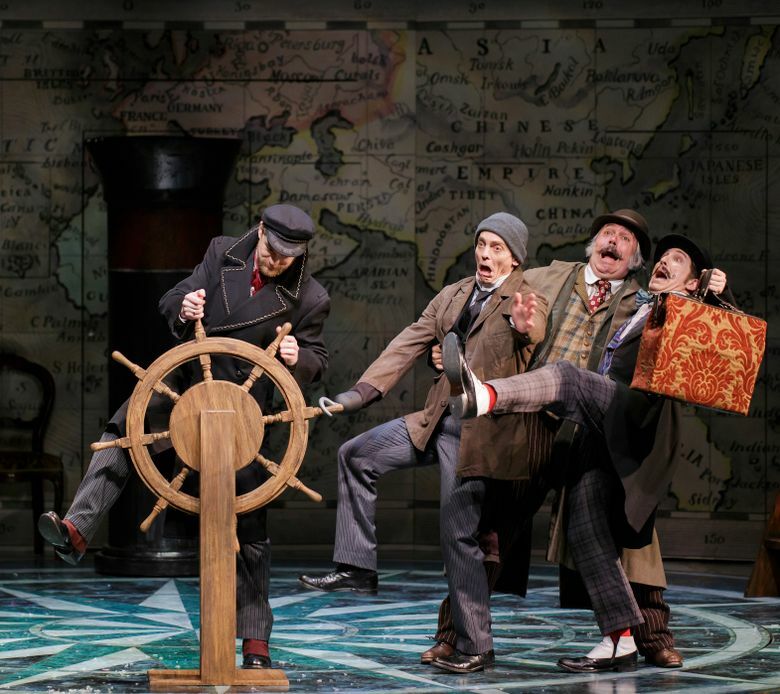 A review of “Around the World in 80 Days,” ingeniously staged by Village Theatre. Ah, travel! We all know its joy and delights, but we’re also aware that too often its thrilling experiences are marred by missed connections, minor disasters and unexpected delays. In Jules Verne’s 1872 novel, adapted for the stage by Mark Brown, the self-confident Phileas Fogg rashly bets his men’s club colleagues that he can circumnavigate the globe in 80 days, a seemingly impossible task in a time when travelers had only animals, wind and steam to move them. Little did Phileas anticipate the many challenges that lay before him. This Village Theatre production, directed by David Ira Goldstein, takes Brown’s good (though not outstanding) play and enlivens it with technical and staging feats that amaze, delight and cleverly reinforce the humor. It took vision on the part of the Village decision-makers to foresee just how well this would play on their stage. Through March 1, Francis J. Gaudette Theatre, 303 Front St. N., Issaquah (425-392-2202 or VillageTheatre.org), and March 6-29, Everett Performing Arts Center, 2710 Wetmore Ave., Everett (425-257-8600). Jared Michael Brown as Fogg is properly aloof and self-assured throughout his adventure. Always the correct English gentleman, he’s convinced he’ll win his bet. How could he not? His adaptable and irrepressible manservant Passepartout, marvelously played with a French accent by Chris Ensweiler, will accompany him. In this show, the audience travels around the world with our two stalwarts and shares with them grand adventures as they overcome numerous obstacles to achieve their goal. They encounter a ritual suttee in India as well as an untoilet-trained elephant, an opium den in China, a typhoon on the open sea. The intrepid pair also crosses paths with scalawags, finds romance, journeys across the United States by rail, survives attacks in the Wild West, and, of course, creatively surmounts each delay and every unforeseen obstacle. Eric Polani Jensen, Jason Collins and Aneesh Sheth, each of whom skillfully plays countless roles, round out the cast. Even Ensweiler does double duty. This theatrical magic is possible not only because of the skill of the actors, much of the credit goes to set designer Carey Wong, costume designer Karen Ann Ledger and sound designer Brent Warwick. Praise goes to the entire production crew for technical wizardry and theater art. Here, the play’s not the thing, the production is.